Heraldry In The News Update! What Is the Deal With That Torse? 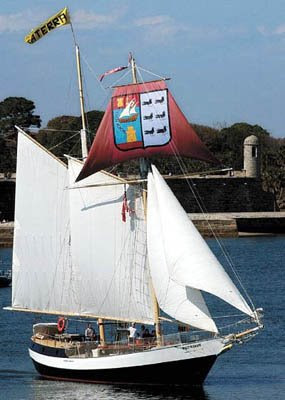 Ah, there’s nothing like taking a ship from one era, putting it in a festival commemorating an event from an entirely different era, and then painting a personal coat of arms on one of its sails just for good measure. Late last January, the schooner Freedom, a ship modeled on 19th-century blockade runners, took part in the Menendez Birthday Festival celebrating the birthday of St. Augustine, Florida’s founder, Don Pedro Menendez de Aviles, the Spanish admiral who was named governor of Florida and began settling St. Augustine in 1565. The admiral was born in Aviles, Spain in 1519, an event commemorated in his arms by the use in one quarter of the arms of Avila (the coat to the right here are the arms of Avila. Compare to the dexter half of his arms on the sail above). He died in 1594. Though Freedom is a replica of a Civil War-era ship (some 300 years after Menendez’s time), it had a billowing crimson sail hand-painted with his coat of arms (well, to be honest, an abbreviated version of his coat of arms; it appears that the coat he used was quartered, not divided per pale. Note the image – it’s small and dark, but it’s the best one I’ve been able to find – of his arms from his headboard to the left). The 10-foot-by-11-foot coat of arms was painted on the sail by Joy MacMillan, a local artist and director of the St. Augustine Foundation. It took MacMillan 4½ days – "full, solid days," she notes – working on the sail for the festival. This was the second year Freedom has participated in the annual birthday festival, but the first in which it (well, okay, "she") bore Menendez coat of arms.